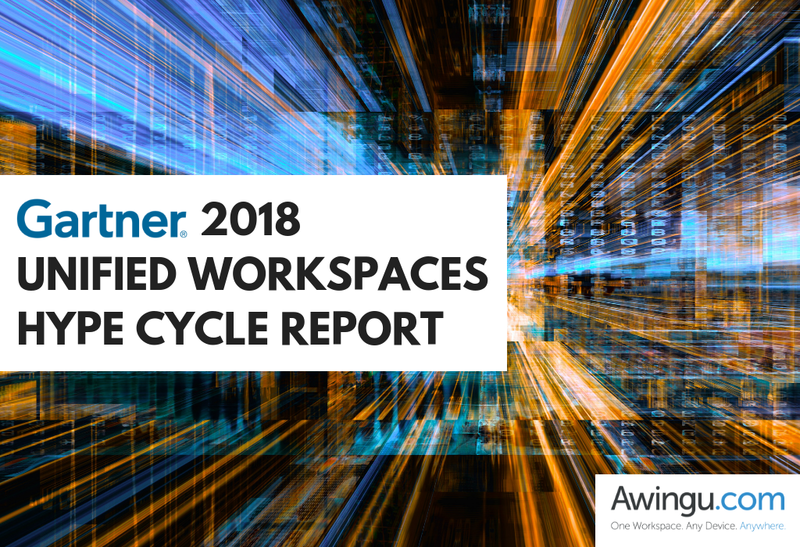 Gartner named Awingu as a sample vendor in the 2018 Hype Cycle for Unified Workspaces in the categories of Unified Workspaces and Workspace Aggregators. That report, its authors Nathan Hill and Federica Troni state ‘should not be viewed simply as a collection of technologies’ but rather as a document that ‘provides insight into how changes in people, processes and technology are redefining the end-user computing (EUC) experience’. The report gives an overview the of technological concepts that ‘enable teamwork and collaboration as well as help employees to be individually productive’. When looking at unified workspace in more detail and from a more concrete angle, Hill and Troni summarize it as tools that ‘enable the secure and contextual delivery of the right applications and data on the right devices, at the right time, to the right location, and in the right format. Unified workspaces deliver secure and contextual applications and data to end users’. Those two definitions encapsulate both the philosophy and functional use of the Awingu workspace: enabling workforces to work from anywhere, from any device. If you wish to find out more about how we can help you to deliver a Unified Workspace to your customers or employees, do not hesitate to contact us!